(Left to right) Samantha Nass (Casey’s), Jay Soupene (Casey’s), Lisa Williams (Hope For The Warriors), Deb McKay (Hope For The Warriors), Bob Meyers (Casey’s), Lindsay Holzer (Hope For The Warriors), Darnell Moore (Casey’s), Kimberly Grady (Casey’s) and Kristen Wilmouth (Casey’s). ANKENY, Iowa (Jan. 30, 2018) – During its annual dog tag campaign, Casey’s General Stores raised more than $670,000 for Hope For The Warriors®, a national nonprofit dedicated to restoring a sense of self, family and hope for veterans, service members and military families. During the month of November, customers of Casey’s General Stores purchased $1 dog tags that were displayed throughout the store. 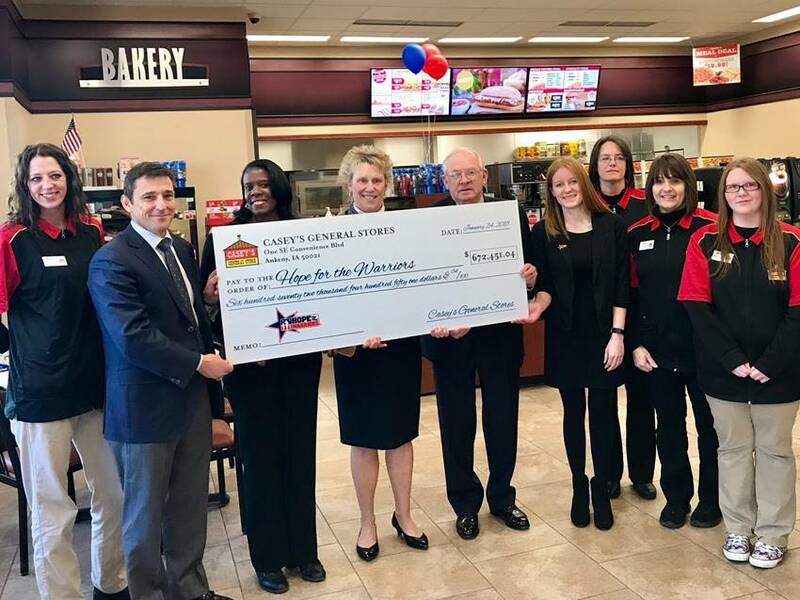 Collective efforts from the more than 1,900 stores located in Arkansas, Illinois, Indiana, Iowa, Kansas, Kentucky, Minnesota, Missouri, Nebraska, North Dakota, Ohio, Oklahoma, South Dakota, Tennessee and Wisconsin raised $672,451.04. Through an additional in-store campaign, a $15,000 donation from MillerCoors was also included in the donation. Funds will benefit veterans, service members and military families through a variety of programming including transition services, clinical health and wellness, sports and recreation and community development and engagement. In six years of supporting Hope For The Warriors, Casey’s General Stores have raised more than $3.9 million.